Titanium-14 K Gold Gold Diamond Wedding Ring - 14 kt white gold and titanium, comfort fit, Wedding Band 7.0 mm wide diamond ring. Diamond total weight is 0.10 ct tw. The diamond quality is VS1-2 in clarity and G-H in color. The center is matte and the outer edges are polished. 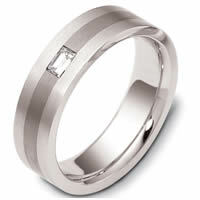 Titanium Diamond Wedding Band - Titanium and 18 Kt White gold diamond wedding band, 7.0 mm wide, comfort fit band. It holds 3 diamonds that weigh 0.48 ct tw, VS in clarity and GH in color. The finish on the ring is matte. Other finishes may be selected or specified. Titanium-14 K Gold Diamond Wedding Band - 14 kt white gold and titanium, comfort fit Wedding Band 6.5 mm wide. 0.20 ct diamond VS1 in clarity G in color. The whole ring is a brush finish. Different finishes may be selected or specified. Titanium Diamond Wedding Band - Titanium and 14 Kt White gold diamond wedding band, 7.0 mm wide, comfort fit band. It holds 3 diamonds that weigh 0.48 ct tw, VS in clarity and GH in color. The finish on the ring is matte. Other finishes may be selected or specified. 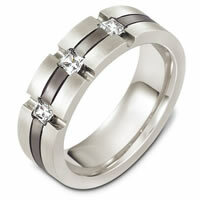 Titanium Diamond Wedding Band - Titanium and 14 Kt White gold diamond wedding band, 8.0 mm wide, comfort fit band. It holds one 0.16 ct diamond, VS1 in clarity and GH in color. The titanium portion is matte and the rest of the ring is polished. Different finishes may be selected or specified. 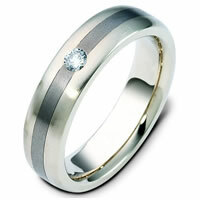 Titanium-Gold Diamond Wedding Band - 14 kt white gold and titanium, comfort fit, 6.0 mm wide, diamond wedding band. Diamond weighs 0.17 ct and is graded as VS in clarity G-H in color. The ring is a brush finish. Different finishes may be selected or specified. 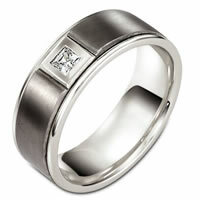 Titanium Diamond Wedding Band - Titanium and 18 kt white gold diamond, 5.5 mm wide, comfort fit wedding band. It holds one straight baguette cut 0.15 ct diamond, VS1 in clarity and GH in color. The ring has a matte finish. Different finishes may be selected. Titanium-14K Gold Diamond Wedding Band - 14 Kt White gold and titanium diamond wedding band, 7.5 mm wide, comfort fit band. The band holds 0.02 ct diamond that is VS in clarity and GH in color. The titanium has a matte finish and the outer edges have a polished finish. Different finishes may be selected or specified. Titanium Diamond Wedding Band - Titanium and 18 Kt White gold diamond wedding band, 8.0 mm wide, comfort fit band. It holds one 0.16 ct diamond, VS in clarity and GH in color. The titanium portion is matte and the rest of the ring is polished. Different finishes may be selected or specified. 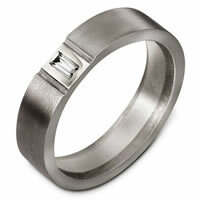 Titanium Diamond Wedding Band - Titanium and 14 kt white gold diamond, 5.5 mm wide, comfort fit wedding band. It holds one straight baguette cut 0.15 ct diamond, VS1 in clarity and GH in color. The ring has a matte finish. Different finishes may be selected. 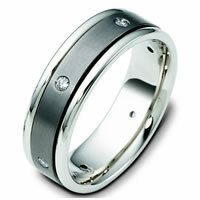 Titanium-18K Gold Diamond Wedding Band - 18 Kt White gold and titanium wedding band, 7.5 mm wide, comfort fit. The band holds 0.02 ct diamond that is VS in clarity and GH in color. The titanium has a matte finish and the outer edges have a polished finish. Different finishes may be selected or specified. 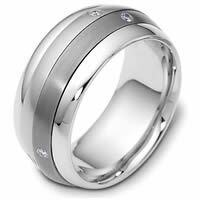 Titanium-18K Spinning Diamond Wedding Band - Titanium and 18kt white gold diamond spinning, comfort fit, 9.0mm wide wedding band. The ring has 0.09 ct tw diamonds that are VS1-2 in clarity and G-H in color. There are 6 round brilliant cut diamonds around the band, each measures 0.015 ct. The center portion of the ring rotates and has a matte finish. The edges are polished. Different finishes may be selected or specified. 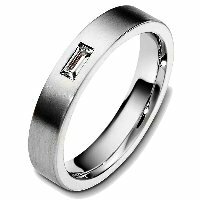 Titanium-14K Spinning Diamond Wedding Band - Titanium and 14kt white gold diamond spinning, comfort fit, 9.0mm wide wedding band. The ring has 0.09 ct tw diamonds that are VS1-2 in clarity and G-H in color. There are 6 round brilliant cut diamonds around the band, each measures 0.015 ct. 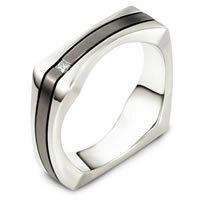 The center portion of the ring rotates and has a matte finish. The edges are polished. Different finishes may be selected or specified. 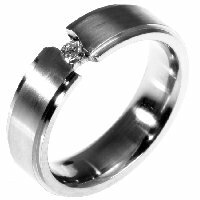 Titanium Wedding Band - Titanium, comfort fit, classic, 6.0mm wide wedding band. the ring holds 0.10ct round brilliant cut diamond with VS in clarity G-H in color.